“Changes in Latitudes, Changes in Attitudes…” Jimmy Buffet. Stories from an artist about embracing a new challenge, living the off-season in a tropical place and finishing a new photo-based book on the incredible Italian wine and food region, Piedmont. 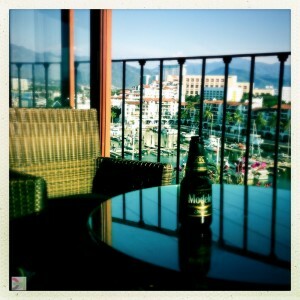 Negra Modelo sweating in the tropical breeze at top of lighthouse. First stop is Puerto Vallarta and the bird’s eye view from the Marina Vallarta Lighthouse, El Faro. The Sierra Madre (think the “Treasure…” from director, John Huston) frame the background to the port that is popular with yachts as well as grande cruise ships. Like the way the sea blue sky is mirrored in the table top. This entry was posted in Beer, iPhonography, Mexico, Uncategorized and tagged Negra Modelo.